A Value Proposition is a headline statement with supporting communications that describes to a specific target market, the jobs your product does, the pain is solves for, and the gain it will provide. It needs to be present not just on your homepage, but on all communications that targets your market, including all entry points to your website. Perhaps most importantly your Value Proposition needs to be understood by, and influence your market to act. If it doesn’t it has failed. How do you create a Value Proposition? This is actually a useful framework I can recommend independently of the authors use of the term as an aid for Product Marketing and Product Management. 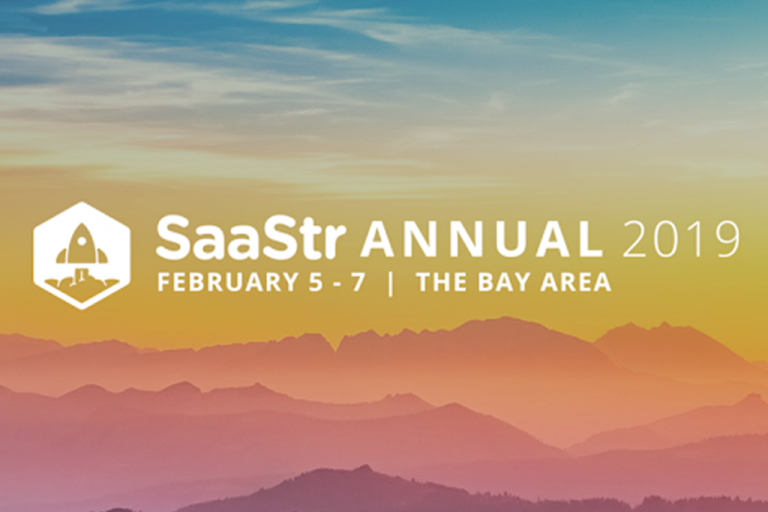 You start using the framework by answering questions like: When you find yourself in the situation that you are using my product; what job are you ultimately trying to get done—what is the underlying task at hand? Social jobs: The things that your customer needs to do to impress others. I’ve always had another way of looking at this. How can you make your customers a hero and get them promoted. For ZOKRI, two of the Personas that love what we do are the CEO and COO. It’s their job to implement systems and processes that support MRR growth. For them we are a ‘Growth Management System‘ which we also turn into ‘Growth System Management‘ as Dashboards, SaaS Metrics, OKRs, Growth Initiatives, Check-ins etc are systems that we align and help to manage a company, it’s people and growth. It’s their job to be in control, manage the company, optimize management decisions as time goes by, and ensure employees have direction, are aligned, focused and happy. The people they want to impress are not just the board, where showing you’re in total control is a must. It’s also team members and employees who want to work for a winning company with great managers. Exercise: What are your customers Functional and Social Jobs? For ZOKRI, unwanted outcomes are often New MRR growth is too low, or churn too high. Or the system they’ve created with Docs and Sheets for managing goals and related performance activities are not working or as effective as they could be when compared to a system designed for that specific job. Obstacles could be that the CEO has not had the time to implemented a Top Down and Bottom Up Goal Management System like OKRs. 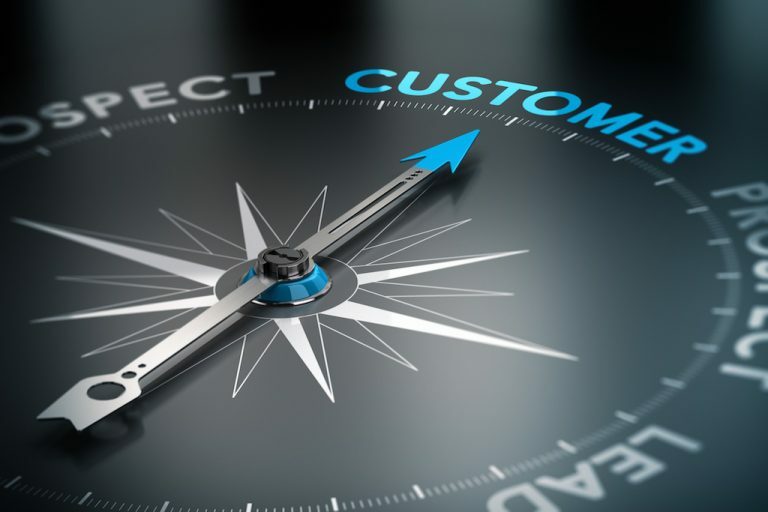 Exercise: What are your customers Unwanted Outcomes and Obstacles? Required Gains: The basic function of the product. For ZOKRI this is it’s much better than the current system or process and it increases company, team and individual performance as measured by ARR / MRR / Team Engagement. Expected Gain: These are the things you just need to be there. For ZOKRI this includes things like being easy to use, having dashboards, alerts, comments, and 3rd party integrations. Desired Gains: These are the things that are a bonus and delight. For ZOKRI these would be early warning or issues, and proactive suggestions of performance enhancing growth initiatives. Exercise: What are your customers Required, Expected, and Desired Gains? 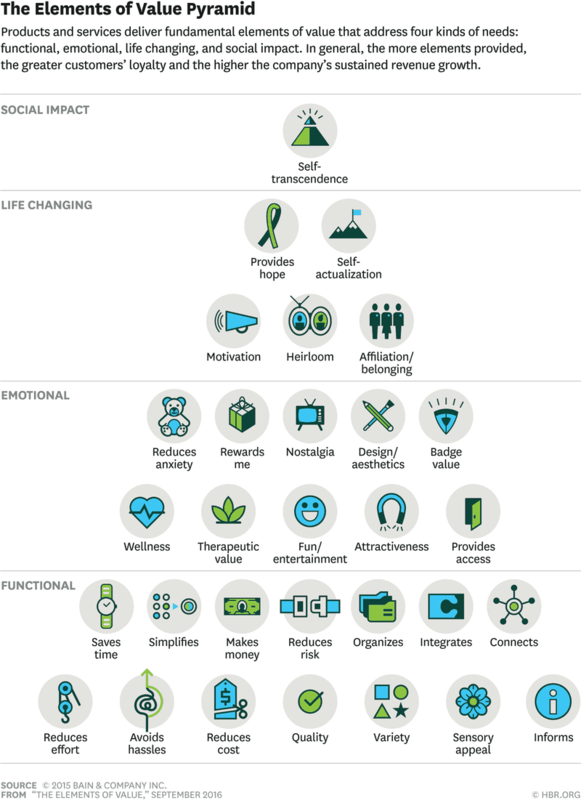 In a 2016 article in the HBR called The Elements of Value, the authors looked at what consumers really value. This was followed up in 2018 with a B2B version that looked at 40 Elements of Value. Both models are really interesting to review and one exercise is to circle the ones that matter most to your customers. Now you’ve done that, check whether this is reflected on your website and other marketing collateral. These models help you be more complete in your thinking and structure your Value Proposition communications. They also should make you think about how you prioritize your product, as excelling at multiple elements was shown to pay-off commercially. Note how some of these are Individual / Personal. These elements may not easily be exposed honestly in surveys or interviews, but nonetheless be very important. Not many would admit to feeling anxious for example. On a scale of 1 – 10 how would you grade your company against each element? 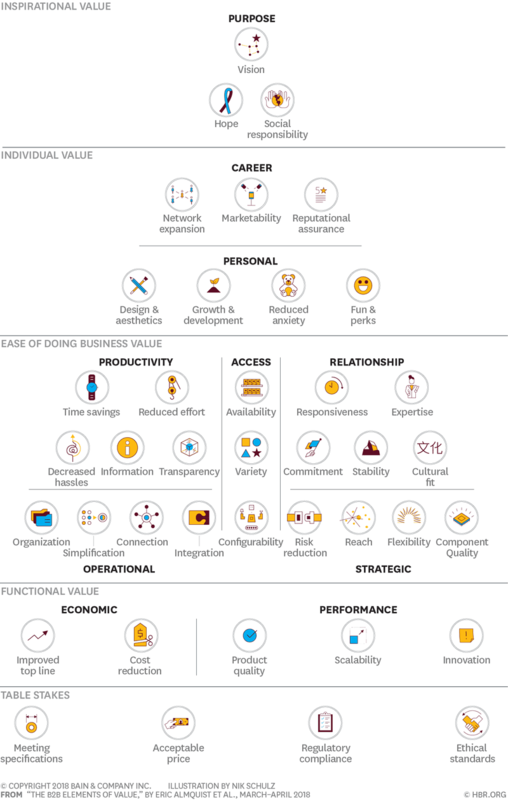 Which of these elements does your company excel at? Which elements should your company excel at as they matter to your customers? Ultimately the task of crafting a winning Value Proposition is to describe how you relieve pain and create gain. You won’t be able to list them all so having some kind of hierarchy and priority order is useful. One of the exercises we did in the planning stages was to create a survey that asked our target customers to score the appeal of value propositions we’d written and captured from other software vendors in related markets. The results were insightful. How would you know that your Value Proposition is resonating? That is your message is being sent, received, understood and acted upon. The answer is in your metrics with specific attention being given to conversion rates throughout the funnel. You’ll find more specific OKRs and initiatives for improving them ready to go in ZOKRI if you sign-up. Your product won’t stay the same for very long, neither will your market (s), and as your Product Market Fit evolves along with your Go-to-market Strategy, so with your Value Proposition. This is why having metrics dashboards, OKRs and a cycle of initiatives that have a goal of improvement is a necessity. 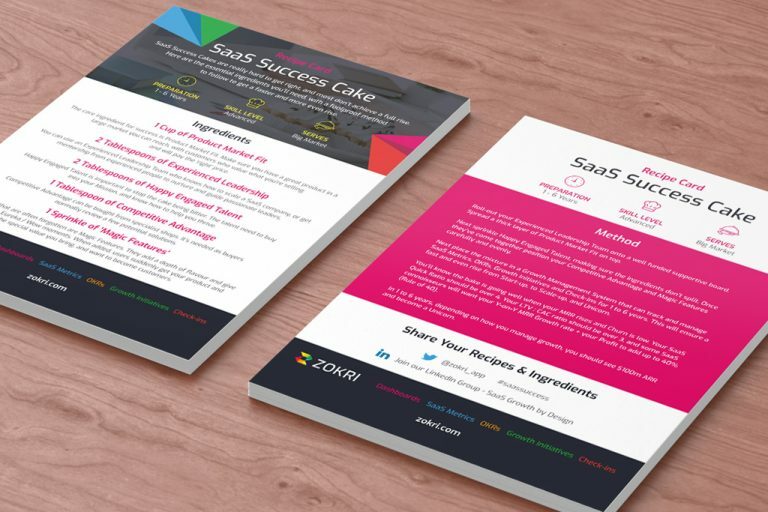 And finally, here are some SaaS Value Proposition Examples. Can you spot Value Elements, Pain and Gain?